The new Arena of Valor hero set to release in April 2019 is Capheny a cute looking marksman girl with BFG (Big Freaking Gun) of her own making named Aquamarine. The exact release date of AoV Capheny is 25th of April. It is two weeks (at the moment of writing this post) until the release and I can’t wait to get my hands on this Arena of Valor character. Already I am positive this will be one of the most influential marksmen in the game. Let me explain. Think of Capheny as 33% Lindis, 33% Jinx and 33% Miss Fortune (the last two are League of Legends characters). Her Skill 1 (Pulse Shot) swaps between two modes, one produces several shots in rapid fire and the other increases in range at the cost of attack speed, similar to how Jinx function. The Skill 2 (Armorbraker) is somewhat boring and unimportant, it provides some movement speed and ability to stack Armor Pierce/Crit Chance stacks. The Ultimate (Fusillade) is very similar to the Misfortune’s ultimate with one important distinction, while MF had to stand her ground during the channel, Capheny can move around with slightly reduced movement speed (30%). You’re probably wondering about the similarity with Lindis? Well, one of the strong Lindis aspects is the ability to cast the 5 charges of ultimate while she is on the move. Capheny, on the other hand, not only can move while channeling the ultimate, her Skill 1 and Skill 2 enhance the normal attack, but on top of everything, passive ability allows her to move while landing those normal attacks in addition to transforming attack speed bonuses into attack damage (1% At.speed > 2 At.Dmg.). This means AoV Capheny will be extremely good at dealing damage while on the move, same as Lindis. As a direct result of this, kiting seem to be the thing for her so the item like Hyoga’s Edge will shine (Frost Cape is an option too, but I like Hyoga’s bonus to magic res and more consistent performance). AoV Capheny’s second skill adds flat armor pierce (or up to 20% crit chance if skill 1 is transformed into Pulse Shot). Because how fast Capheny can land multiple shots during her Rapid Fire mode, Spear of Longinus will be the ideal solution for her, especially in combination with the ultimate… the amount of shred over the area is incredible. Already she needs to stack 10x Armorbreaker, so adding additional value to those stacks with Spear is a perfect fit. More calculation needs to be done in case Muramasa or Rankbreaker provides more benefits, for now, my vote goes to Spear just because of how good it fits with Capheny skillset. Another stacking item, Devil’s Handshake, also seem to be extremely good for this Arena of Valor hero. At 5 stacks Devil’s handshake provides 160 Attack Damage, 20% crit, and 5% movement speed, all very important for Capheny. Taking into account all the bonus to crit chance, I am positive Claves Sancti will play a significant role. With this item, it makes a grand total of 65% crit enhanced by additional 50% crit damage. The beauty of AoV Capheny is this: almost all physical damage items synergize well with her toolkit. Crit, attack speed, on hit, attack damage… she can be effective in multiple scenarios and with different item builds. 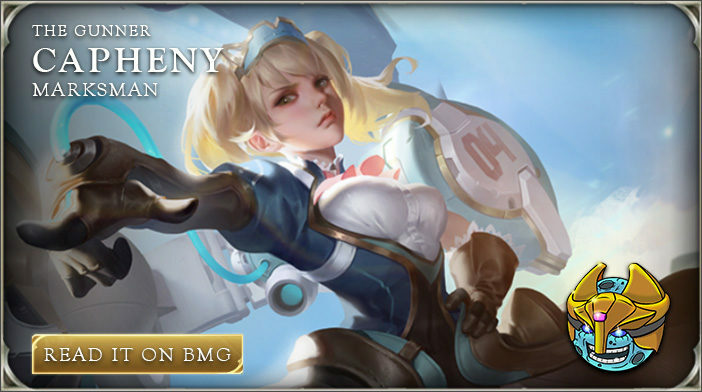 It is obvious AoV Capheny will play a significant role and will rise to the top of almost any Arena of Valor Tier List, and this is not the case because numbers are overpowered(not sure until some more testing in 5v5 is done), but rather because of how good her design seems to be.